Impression Material. One 8 fl oz bottle. Health & Beauty. DDS categories. Aussie 3 Minute Strong Conditioner. Long life for long hair. With a touch of Lotus Flower and Australian Silk Extract. It's your own little miracle. Radiant hair in one use. Contains natural Australian ingredients. Directions Work into clean, wet hair. Rinse with warm water, then cool water, then go! Manufacturer P & G-Beauty. It's your own little wonder for any wrongdoing done to your 'do. Make naturally beautiful hair simply happen. We believe in the quality of our ingredients - they treat your tresses right and make it easy for you to get what you've always wanted: clean, simple, beautiful hair. 3 MINUTE MIRACLE. DEEP CONDITIONER. 1.7 fl oz / 50ml Perfect Trial or Travel Size. Promotes Silky & Soft Hair. You can use this daily or once a week. With a touch of Olive Oil and Australian Ginseng. With a touch of olive oil and Australian ginseng. Also works for all hair types. NEW Aussie 3 Minute Miracle Strong Conditioning Treatment 8 oz NEW sealed. Condition is New. Shipped with USPS Priority Mail. Aussie 3 Minute Miracle Deep Conditioner 8 oz W/ Avocado & Australian Jojoba Oil. Condition is New. Shipped with USPS First Class Package. 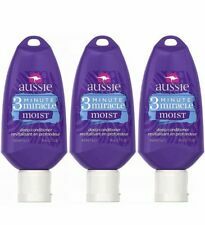 NEW Aussie Moist 3 Minute Miracle 3x Deep Conditioner 8 oz. Condition is New. Shipped with USPS First Class Package. Stored in a cool, dry place. Smoke-free home. IMPORTANT INFO: Buyer is responsible for reading entire listing and asking all questions prior to bidding. Shipping insurance available upon request. For packages over 16lbs, shipping charges may increase. Please check out my other auctions for combined shipping. Conditioner- 13. 5 o z.
Aussie 3 Minute Strong Conditioner. Long life for long hair. With a touch of Lotus Flower and Australian Silk Extract. One 8 fl oz bottle. Lengthens the life of your locks by helping reduce breakage. New, unused condition. See all pictures for details. Aussie 3 Minute Miracle Reconstructor Conditioner 250ml. Pop a splodge of 3 Minute Miracle onto clean wet hair. Leave on for 2-3 minutes depending on how much of a treat it needs. Rinse with warm water. 2 Aussie 3 Minute Miracle Moist Deep Conditioning Treatment, 16 fl oz. 2 Pack. Total 16 fl.oz. We will also send you a Miss Spa red wine extract facial sheet mask. 88oz that protects soothes and hydrates skin. Weekly, massage into clean, wet hair. Rinse after 3 minutes. Revives dry hair in just 3 minutes! 3 MINUTE MIRACLE SHINE 8oz. 24 Hours shine in 3 minutes. Deep Conditioner. Apply weekly, work into clean, wet hair. Wait 3 minutes then rinse, dry and bask in your miraculous hair. Deep Conditioner. tubes may have blemishes . Deep Conditioner. bottles may have blemishes. "3-Minute Miracle". its your own little miracle! Deep Conditioner. Directions: Work into clean, wet hair. Rinse with warm water then cool water. We will respond within 24hrs. Hello eBay shoppers this buy it now listing is for 1 Aussie 3 minute Miracle Moist Deep Conditioner W Avocado & Australian Jojoba Oil. 8 oz Condition is New. Shipped with USPS First Class Package. Impression Material. Health & Beauty. 6 8 fl oz bottles. DDS categories. New. Purchased unsealed as part of a set. Authenticity guaranteed. 1 Shampoo - 400ml / 13.5oz. 1 Conditioner - 400ml / 13.5oz. 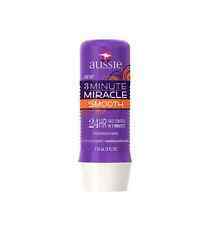 Aussie 3 Minute Miracle Smooth Conditioning Treatment 8 oz. Condition is New. Shipped with USPS First Class Package. Up for your consideration. The Fine Print. That includes zooming in on all pictures. Shiny waves in 3 short minutes. vs. an ordinary conditioner. Weekly, work into clean, wet hair. Wait 3 minutes then rinse, dry and bask in your miraculous hair. Miraculous part is how easy it is! Once a week, work it into clean, wet hair. your hair with deep conditioning while keeping your color bright and shiny. One 8 fl oz bottle. wait three minutes, and rinse it out. LOT OF 3.AS PICTURED. YOU WILL RECEIVE 3 FULL SIZED 8 FL OZ BOTTLES AS PICTURED. ITEM : 3 Minute Miracle Color. 10x The protection in 3 minutes. 8 fl oz / 236 mL. CONDITION : NEW! If an item was unintentionally misrepresented or a mistake was made on our part, we will make it right! Transforms Dry Hair Into Silky Shiny Curls, With Coconut And Jojoba Oil, Sulfate And Dye Free. Long life for long hair. Work into clean, wet hair and leave on for 3 minutes. 3 Minute Miracle. 10 X STRONGER IN 1 WEEK. 8 fl oz/236 ml~~~FULL SIZE. STRONG . Wait 3 minutes then rinse, dry &. super shielded locks in just 3 short minutes. bask in your miraculous hair. Jojoba Oil & Sea Kelp, this deep.